Be a Hero – Thank a Vet! D I D Y O U K N O W ? You can donate blood once every 56 days – Act soon and you can donate three times during our Campaign! Your donation can save up to three lives! Thank You to Shawn O’Hargan from the Red Cross for her support throughout our 2017 Campaign. Our Sleeves Up Campaign was a Great Success ! 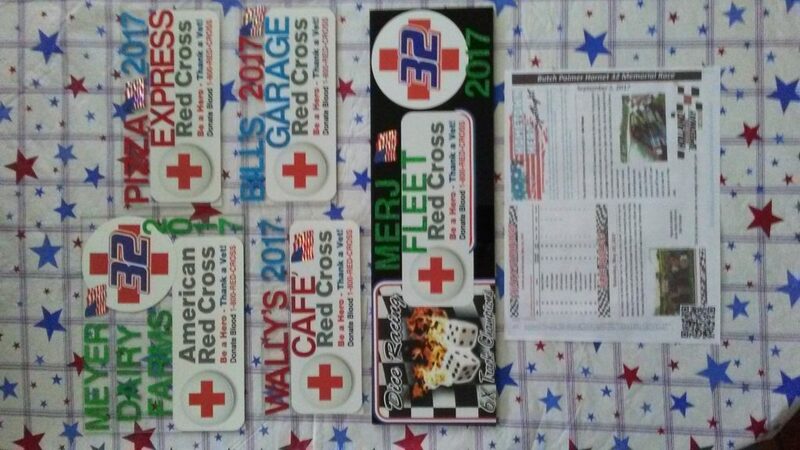 Special Thanks to Karen Wittek Szafraniec for co-administering the campaign and our friends and family for their assistance throughout the campaign and at the Holland Speedway 2017 Butch Palmer 32 Memorial Race. Thank You to All of our donors, including Judy Naylor our top donor (11x Platelet Donations during the 195 day Campaign) and last moment track pledgers. Congratulations to Bob & Sue Palmer; Bob’s perseverance was a true tribute to his Dad; Bob’s focus on the 2017 Track Championship was proven ! Bob Palmer 2017 Track Champion; The Dice Racing Team’s 7th Track Championship in the past 9 years ! The Need Is Urgent ! PLEASE Pledge to Donate Blood as soon as Possible ! 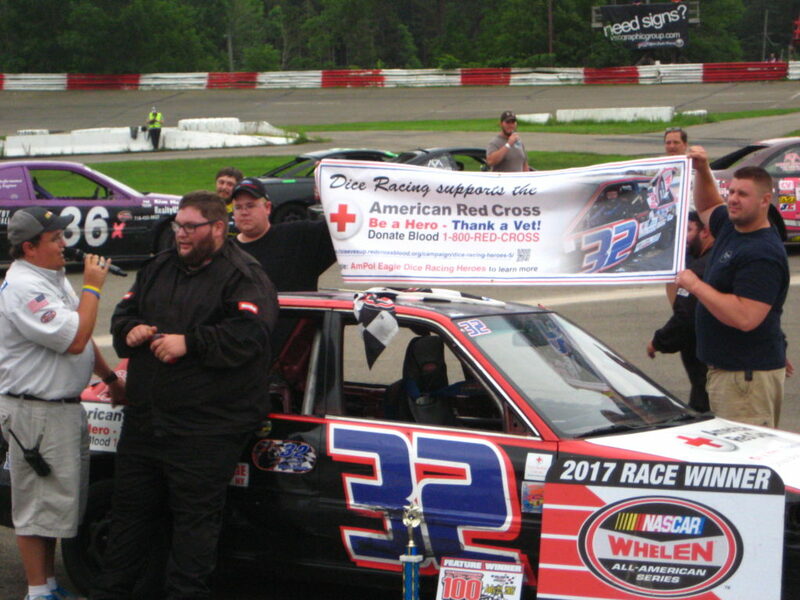 Promoting our Red Cross Campaign at the First Responders Appreciation Night 8/26/17 at Western New York’s “NASCAR Home Track” Holland International Speedway ! —Thank You for visiting our RED CROSS SLEEVES UP Link. We’ve just reached a total of 43 Pledges/Donations; our Goal is 50 by Saturday 9/2/17. 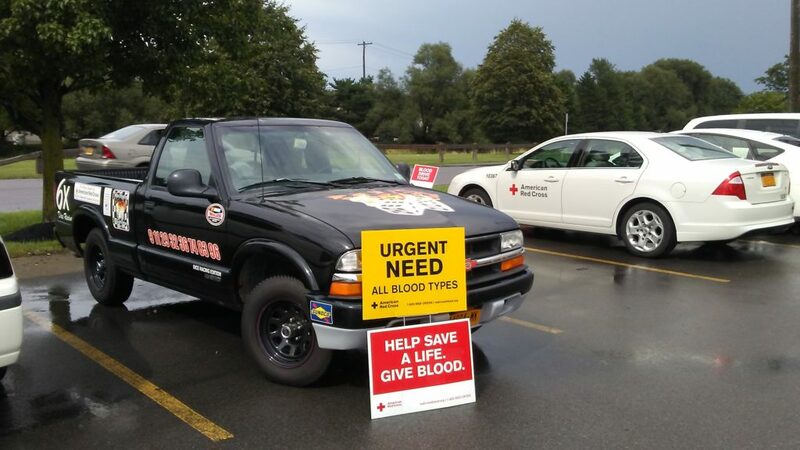 The Red Cross Desperately Needs All the Help it can get; Be a Hero – Save A Life ! Please Pledge and schedule to donate as soon as you can ! Thank You ! September 2nd, 2017 is the Final Day to Pledge Your Support ! September 2nd marks the bitter-sweet conclusion of the 2017 Dice Racing Heroes Sleeves-Up Campaign! Thank You for your support ! The Entire Team will be at Holland International Speedway to Celebrate the Memory of Butch Palmer and to compete in the NASCAR Home Track Season Championship and Butch Palmer 32 Memorial Race.! 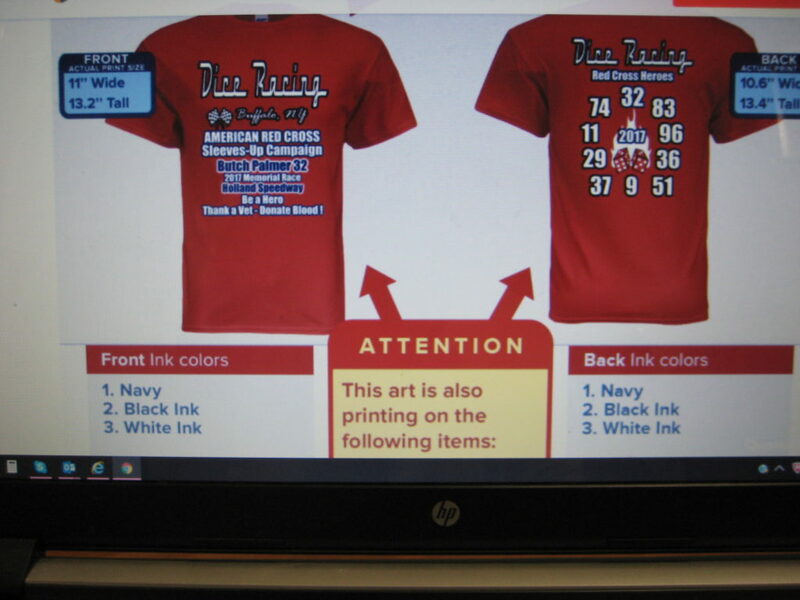 The Red Cross will be there ! 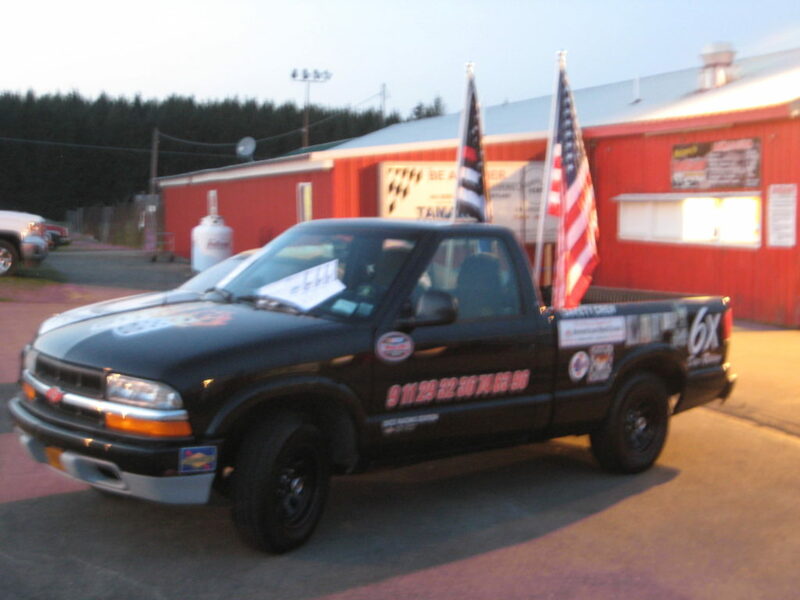 – Please Say Hello and Thank You for Always Being There Whenever America Is In Need ! Remember You Can Make A Difference ! Please Pledge to make your next donation (*future appointments count) before September 2nd to Help Us Reach Our Goal of 50 Donations ! It will be easy to tell who the Dice Racing Heroes are ! Hint: They’ll all be wearing the same thing !!! HONOR & PRIDE – 10 days left to make your pledge ! Dice Racing Heroes – Driving to Make a Difference ! * Your pledges/donations WILL SAVE LIVES ! – Be a Hero – Thank a Vet ! 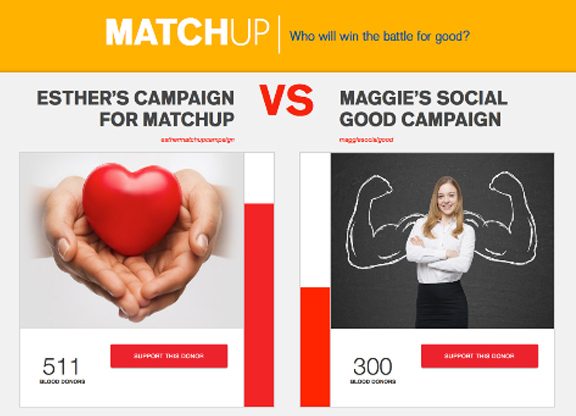 — Be a Winner – Donate ! Only 15 Days left to Make a Difference ! Day 180 of 195 = 28 The NEED IS URGENT ! PLEASE HELP – ONLY 22 Pledges/Donations needed to meet our 2017 Sleeves – Up Campaign Goal of 50 ! The Need is URGENT ! – “Be a Hero !” -Please Donate ! ONLY 23 Days left to step up and pledge/donate ! Look in the mirror – See the Hero within ? The need is URGENT ! YOU can save lives ! Please Pledge & Donate ! Only 56 days left in our Sleeves Up Campaign; our sponsors are behind us all the way ! Please take the time to make a difference; Pledge to Donate Now ! Tell a Friend – Thank a Friend ! Please remember to Thank our Sponsors for their continued Support ! The Need Is Urgent ! Only 64 days remain to be a “Dice Racing Hero !” Only 64 Days until the Butch Palmer Memorial Race at Western New York’s NASCAR Home Track – Holland International Speedway ! The Race is ON ! 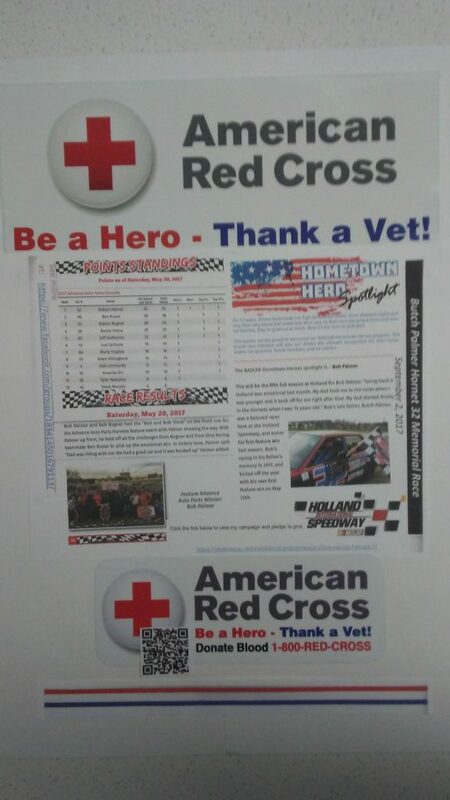 Please pledge and donate in the next week and you will be able to donate again on the Red Cross Donor Bus, scheduled to be at Holland Speedway on September 2, 2017 ! 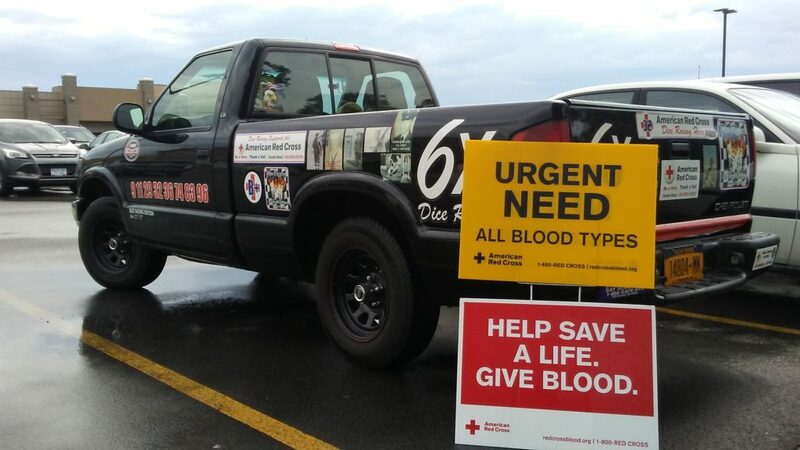 The Need for Blood at this time of year is Urgent ! We have just reached 16 Pledges/Donations; we need 34 more to reach our goal of 50 ! 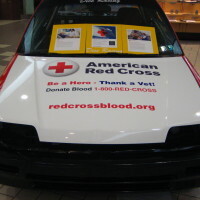 “Be a Hero – Thank a Vet – Donate Blood ! ” Check out Bob Palmer’s tribute to his Dad; Butch Palmer the #1 Dice Racing Hero in 2016 ! 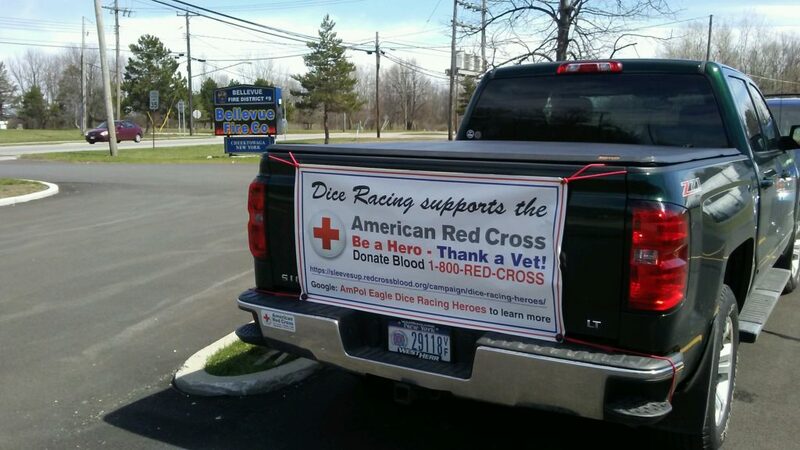 To Learn More Please Google: The Buffalo News – Butch and Bob Palmer, and The AmPol Eagle Dice Racing Red Cross Sleeves Up Campaign. Only 101 Days Left to Pledge!! Hey Dice Racing Fans and Drivers! There are only 101 days left in the Dice Racing Heroes ARC SleevesUp Campaign. Thanks to our loyal donors, Judy Naylor and Robert Szafraniec, we have 10 pledges! We need to spread the word and get our fans and drivers to participate too! Please share our campaign details on your Facebook page and Twitter feed! 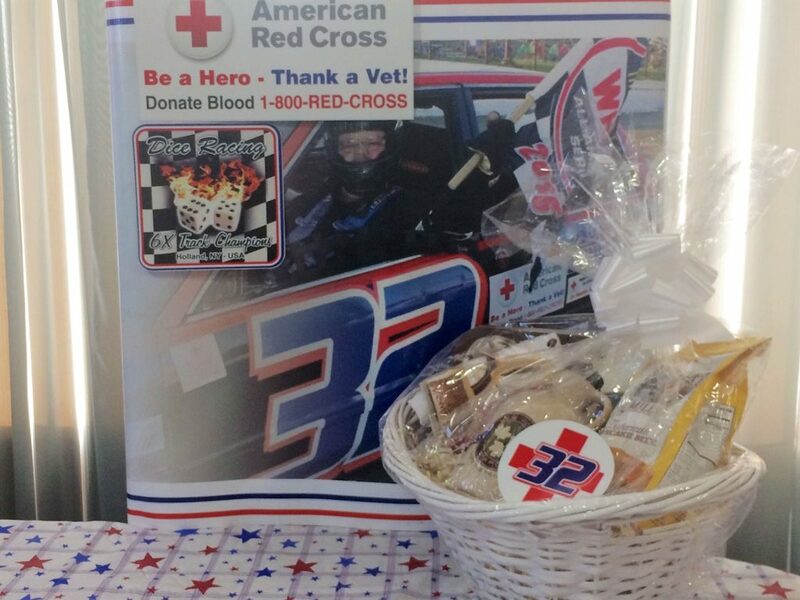 Our 2017 Donor Appreciation Giveaway begins today … For each pledge, we will enter you into a raffle to win a Gift Basket! The winner will be announced on the last day of the campaign. Good luck and please help save lives! 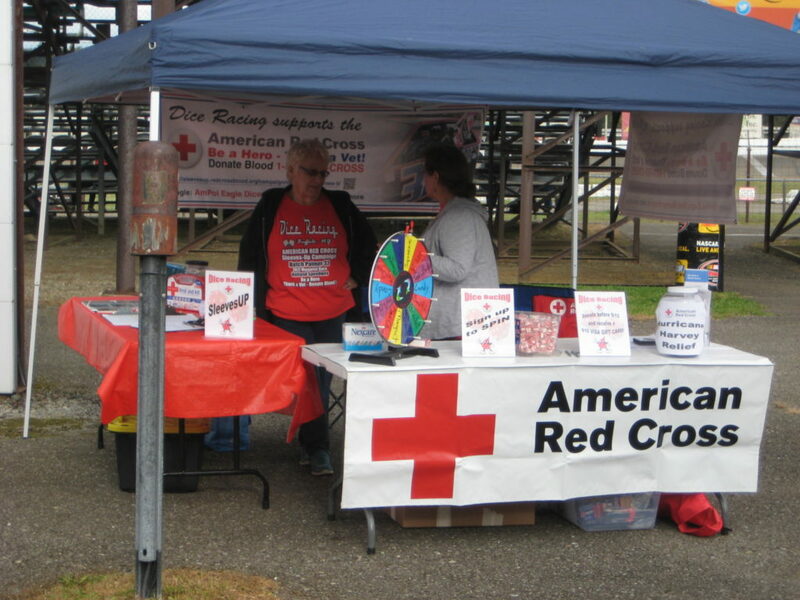 Dice Racing at the Bellevue Fire Company Flea Market on April 8, 2017, promoting our Red Cross Sleeves Up Campaign. Special thanks to our top donor – Judy Naylor! Please help us reach our goal of 50 donations.